High Priestess says that the Magician produces concentration without effort – a pure act of intelligence. Only through “reflection” can we become conscious of this pure act as it produces an “inner” awareness which is retained in your memory. Intellect alone – not fertilized by imagination and guided by the heart – is sterile. There is always activity beneath the surface – the whole picture can not be seen at this point – there is much depth. Within your unconscious mind, there is pure knowledge from the past – use your intuition and you will receive spiritual inspiration. 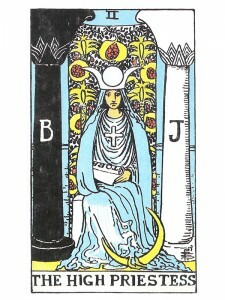 The High Priestess represents “reflection”, she is the wisdom which builds your house. Your dreams and meditations bring to the surface the hidden, subconscious past and future. Develop your philosophical sense – practice it and begin to “write your book”. All memory is recorded in your subconscious mind – probe below and get to the bottom of things. Keep the opposites in balance – be still, remain patient and reflect. God has much more to reveal to you. Consciousness results from two things – the “active” or question, which activates a principle and the “passive” or answer, which reflects it. Be true to yourself, never compromise your visions and you will find that which you seek. You are the peacemaker and you can see both sides – recognize that elements are at work that are not obvious on the surface. Listen to your “inner” voice – it will allow you to see the whole picture and arrive at a sensible response to the question of what it is you really want. The language of the Master is love – not psychology, philosophy or science. Pure intellect only reflects, while Love “acts”. Spirit is neither intellect nor imagination – it is Wisdom and Love combined. Happiness is your natural condition – it is your true Self – come to know it now. Spiritual intuition permits contact between your consciousness and the world of pure experience – which must then be expressed outwards. To obtain this state of waking consciousness, which is the reflection of your subconscious – allow yourself to be seated. Establish an active-passive state of consciousness – a state of mind where your soul “listens attentively in silence” as you apply yourself totally to a problem or question. Be yourself in any situation – always have complete faith in your feelings and KNOW that light will soon be shed on your situation. Listen for the message, be patient and wait for the static to clear – then communicate your truth, for only in truth will you be of service to others and to yourself. Here is the birth of duality – the beginning of life in the emotional body – physical aspects of your emotions. In any position this may be a figure of great importance to you – such as a teacher or guide. The root of all feminine principles. What rhythms or cycles do you need to be aware of? What knowledge are you seeking? What do you need to remember or “discover”? Is it appropriate to do so? How can you best use your intuitive, psychic or dream abilities at this time? Who is seeking your counsel, or whose are you seeking? In the first position: This is a lifetime dedicated to the work of the High Priestess. The main thrust of the next century – even the next millennium – is to balance the feminine with the masculine, by reasserting the feminine. Women must do this as well as men, for the effect of the masculine is in them also, and indeed was brought about by both men and women. We have done this to each other in partnership, and we must undo it together. In the second position: You are rooted in natural principles and can fall back on a storehouse of excellent instincts. Natural foods, natural medicines, keep you and your loved ones fit. Female energy is the main force in your environment, health, work, and perhaps even your exercise/leisure athletics. A significant part of your foundation may derive from a person embodying The High Priestess. In the third position: You are being washed with universal feminine truths. Valuing all creation is uppermost, respecting nature and man’s place as part of nature, working in harmony with the environment instead of trying to dominate it. Great sensitivity to life. In the fourth position: This passion in this young heart was to be the classical heroine of mythic proportions – prior to its reduction by a male dominated civilization. This is the heroine/hero which lives in both woman and man waiting for their talents to be called on to save the day. Perhaps there is even a historical or imaginary, feminine hero figure living in your dreams. In the fifth position: You have tremendous inner confidence in making decisions at this time, partly because intuitive right – brain functions are so accessible. Great capacity to listen and learn. In the sixth position: In the near future, put more time and attention on yourself first and then loved ones. This can also mean a creative project crying out for completion. Look to your deepest desires and bring them into the light. In the seventh position: Work to integrate the subconscious more fully with the conscious mind. Begin or increase your study of the occult, mysticism, esoteric philosophy and/or metaphysics. In the eighth position: You are awash with healthy energy, creative projects on line and productive. Mysticism is a positive force in your affairs. Environmental issues may be dominating the moment. In the ninth position: The heart is immersed in the feminine world, in appreciation of nature and the natural. There is great love of the Mother, with complete trust in her judgement and ability to soothe your cares. In the tenth position: Here is the protecting umbrella of the Mother. A burst of creative energy for you, and enough revelation to know what you are supposed to do with it. Nice app… happy to be connected! High Priestess is my card of the day, today that I picked… There are two sides to every story is so important to see, whether it be feminine and masculine, hell and heaven, dark and light. Thank you for this useful insight, especially since my new kitten is called Priestess. Interestingly enough, that’s also the card for my birthday, although I’ve got a few different opinions on that. Oh happy day. Anyways, isn’t there a question to ask of the cards, are you supposed to say it to yourself, or is a general fortune telling reading? Thanks for dealing the cards… from who or where cometh this insight? Really cool. I’ll look into this further, listening to the language of love… Have a nice day. Hi I drew this as card 9, my question is does the message mean mother earth? Consider staying in the present moment and letting the rest go. The future does not exist, when it manifests it will be in the present moment – which is when you will need to deal with it. The cards have a multitude of information … focus only on the sentences which actually evoke an “emotional” response. “That’s not me” – ignore, “whoa, hit the nail on the head” – listen closely to that sentence. Things have been interesting looking indeed. Now how does one transcend the Matrix, my Lord Morpheus?